It is time, the Winter Games are here. Usually slips on ships are a bad thing, but with the elite of the global games arriving in South Korea, people will be whooping and cheering for their favourites on the slopes, down the ice runs and on the rink. So, who will be the seafarers’ heroes at Pyeongchang? This year’s Winter Games will feature 102 events in fifteen sports disciplines, including the addition of big air snowboarding, mass start speed skating, mixed doubles curling, and mixed team alpine skiing, plus, most importantly, 2,952 athletes, competing in the hard cold of South Korea. The Alpensia Resort in Daegwallyeong-myeon will be the focus of the 2018 events. With other venues being used for a host of events. While the games focus on white stuff, namely snow- the event is also home to the darkest building on the planet. Yes, among the ice rinks and bobsleigh tracks stands something completely different: the angular black hole, is a temporary pavilion for car giant Hyundai, designed by British architect Asif Khan, the world’s largest continuous “nanostructure” has been sprayed with a coating of Vantablack Vbx2, a super-black material that absorbs 99% of the light that hits its surface, creating the illusion of a void. So, with the whitest slopes, the blackest building and with gold, silver and bronzes aplenty, what else is there to look out for at the games? Obviously, the combined majority of the world’s seafarers are from the Philippines and India – countries which do not usually excel, understandably, at winter sports. However, there are still representatives to cheer on for those who are out at sea. The Philippines team is making its second consecutive participation at the Winter Games after they participated in the 2014 edition in Sochi, Russia. The names to look out for are Michael Christian Martinez and Asa Miller. Martinez is going in the Men’s Single Skating – so be sure to watch out on 16th/17th February, while Miller is heading downhill in the Alpine Skiing (also known as downhill skiing). This is a race between skiers, the mountain and the clock, and the drama doesn’t get more picturesque than that. For the Indian team, they also have two male athletes competing in two sports. These are cross-country skier, Jagdish Singh, while Shiva Keshavan qualified in men’s singles Luge. We wish them every success, and hope those at sea will be following the action. So, of all the nations of seafarers – we thoughts we’d look at the highest hopes of medals, glory and of doing the nation proud. Of the top seafaring nations, who is likely to come out on top? China, Russia and the Ukraine all figure in the top seafarer supply nations – but what will that mean on the snow and ice in South Korea? China has some 82 competitors this time – and there are some pretty high medal hopes amongst them. This is being seen as a dress rehearsal for the 2022 games, which are due to be held in Beijing/Zhangjiakou. However, winning is still, literally, the name of the game. China has been very successful at converting second-tier gymnasts into top-level aerial skiers — the sport, after all, is effectively gymnastics on skis. Xu Mengtao, this season’s World Cup champion, is widely tipped to win the women’s competition, while Qi Guangpu and Jia Zongyang (bronze in Sochi 2014) both have medal chances in a competitive men’s division. Pairs figure skating, Sui Wenjing and Han Cong are hotly tipped to claim the title and would be hugely popular winners. They won gold at last year’s World Championships but are wrestling with some minor injuries which could hamper their quest for glory. For the real hopes of the China team, we have to look to the short track speed skating event. This event provides China with its best hopes of a sizable medal haul. Wu Dajing (men’s 500m) and — if fit — Han Tianyu (men’s 1500m) have been tipped for success alongside the men’s 5000m relay. For the women, Fan Kexin and Zhou Yang will both line up for the women’s 500m. This is where things get a little complicated… Due to the Russian “doping controversy”, only certain Russian athletes are permitted in Pyeongchang. An initial list of 389 athletes was narrowed down from a “pre-registration pool” of 500 and more than 80% of these did not compete at the Sochi Games, an event found to have been corrupted by state-sponsored doping. Hopefully things will be cleaned and cleared up for 2022. Thirty-three athletes, including 17 men and 16 women, will represent Ukraine at the Winter Games. This is the smallest number of athletes who have ever represented Ukraine at the games. Ukrainians will compete with the best athletes of the planet in nine out of 15 sports, in particular, biathlon (11 athletes), figure skating (four athletes), luge (six athletes), freestyle skiing (three athletes), cross-country skiing (four athletes), alpine skiing (two athletes), snowboard (one athlete), skeleton (one athlete), and Nordic combined (one athlete). So, what about the other great shipping nations? Who can expect to see their flag hoisted not only on the stern of the world’s ships, but flying high against the backdrop of bright blue skies in South Korea? When one thinks of shipping nations, obviously Denmark and Norway figure highly -and of course they are represented at the games. What of the other shipping powerhouses? Well none of the biggest flag states have teams – so there is no representation from Panama, Marshall Islands, Liberia or the Bahamas. So, the flag States which are representing are Hong Kong, Singapore, Greece, and Malta – but there are only a handful of athletes between them. For Hong Kong, Arabella Ng will be slaloming, for Singapore Cheyenne Goh takes to the short track speed skating arena, Greece harbours hopes in the skiing with 4 athletes and Malta will be cheering for Elise Pellegrin in the giant slalom. 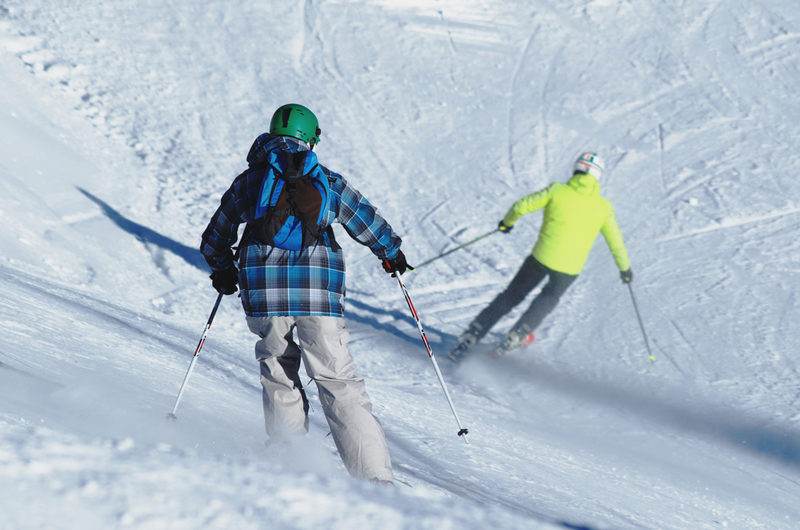 For most people though, the Winter Games is a chance to explore new sports. The curling, bobsleds and pure drama of the downhill skiing and jumping will see medals won and new heroes made. Through KVH, seafarers will be able to follow the events, and we hope you enjoy it, now where are our cowbells?